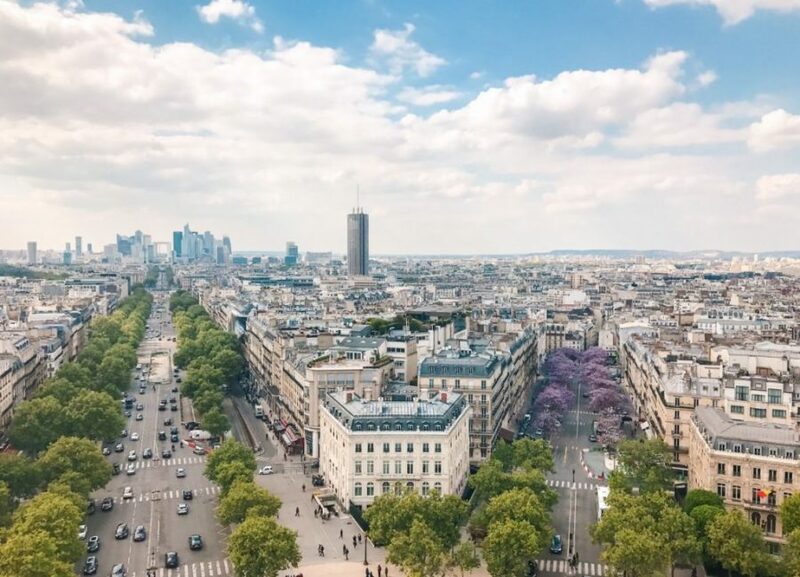 My last trip to Paris resulted in me really hating the city, so when my best friend asked if I wanted to join her for a long weekend in La Ville Lumière… I wasn’t totally sure. However, she’s awesome (for real) and flights weren’t too expensive so I decided I would go. I don’t regret it ONE bit! 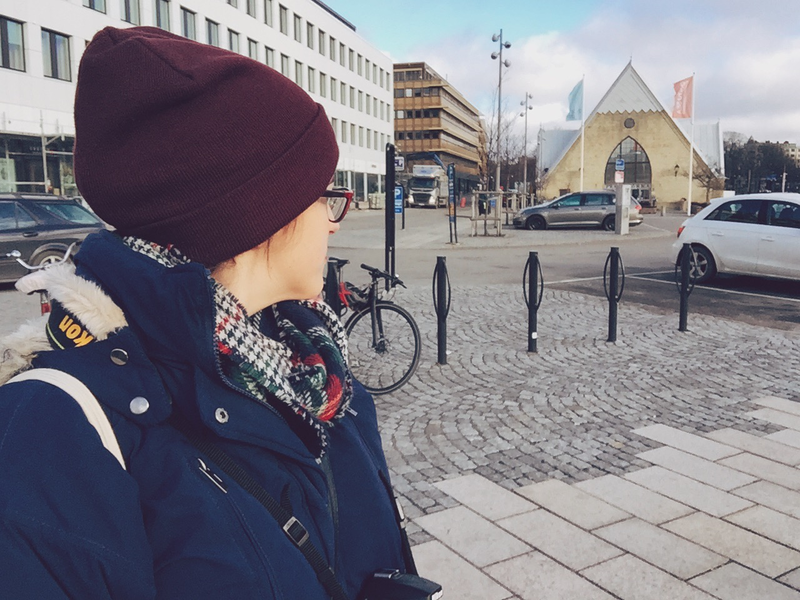 I think it ended up being one of my best trips this year (maybe even the best trip so far) and we had an amazing time, plus we pretty did our own Instagram-inspired tour of the city. So, what are the most beautiful places to visit in Paris? Here are our top picks for the most awesome photo opportunities in the city! I didn’t make any promises that these would be ‘hidden gems’ because this is probably one of the most photographed spots in Paris. But you know what? 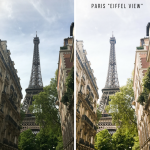 It’s pretty darn epic and possibly one of the most beautiful places in Paris for views of the Eiffel Tower – possibly one of my favourite Instagram places in Paris! I highly recommend going there at sunrise because otherwise it is crazy busy. If you go at a busy time then you end up waiting for people to get their photos and move out the way and no one really wants to stand around waiting to get that perfect Insta shot, right? I also recommend not wearing a skirt made from a satin/otherwise slippery material if you’re going to sit on the wall… because after this photo was taken I tried to get off the wall and ended up sliding part way down the wall. And let’s just say there’s a huuuuuuge drop the other side. It was mildly terrifying. Oops! Looking for the most beautiful places in Paris to visit in three days? 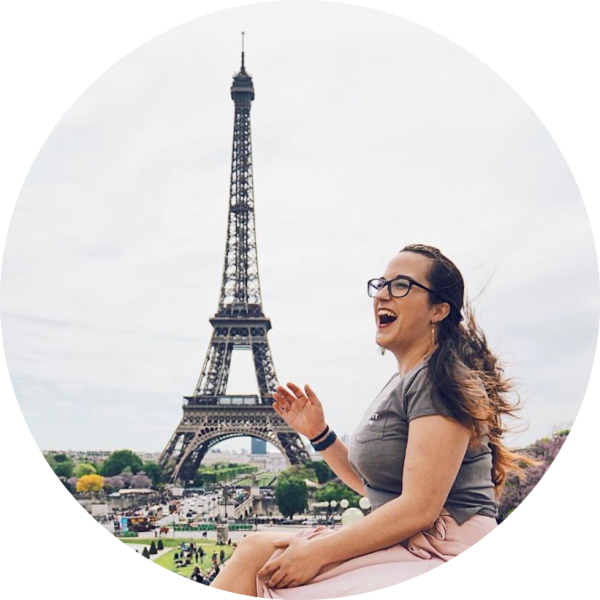 Check out Natasha’s itinerary for three days in Paris! Wait, a shopping centre is an Instagram spot? In Paris it most definitely is! After you’ve spent some time window shopping the designer clothes and handbags, head up to the terrace to find a café with some of the best views over Paris. Sunset is a perfect time to head up for a drink or two to see just how beautiful Paris is! 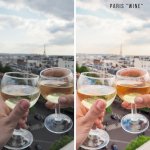 A glass of wine and views of the Eiffel Tower? Count me in! Zohra originally spotted this on an Instagrammer’s feed and spent forever trying to figure out where it was. Seriously, tag your locations people, it will save me sooooo much time (for real though). However, there’s also a great café nearby to get your caffeine fix – Café Kitsune is both coffee heaven and Insta-spot! Are you curious what camera I use? I love my Olympus E-PL8 – perfect for carrying around all day and it barely takes up any space, plus it has all the features of a DSLR! Bonus points for it being ultra cute, too. It’s not exactly the most unique find ever, but a visit to (and up!) the Arc de Triomphe is a must. When Zohra and I went, we met up with a friend of mine from school who is living and working in Paris. It was his first time going up the Arc de Triomphe as well and I quote, “I should have done this before”. Of all the beautiful places Paris has to offer, this is definitely one of the best (and most touristy!). The views are impressive! I would 100% recommend getting a skip-the-line ticket – I might be British but I really hate queues. Really. Hate. Queues. We bought ours from Tiqets and I highly recommend them! The ticket gets sent straight to your email, no physical ticket required. Of course, the Arc de Triomphe is a tourist hotspot so it will be busy at pretty much any time you want to visit. However, since it is ticketed they control how many people are there so it’s not so bad and you can definitely get some awesome shots! Important note: there is no lift so you have to climb the 284 steps. Great to work off a big lunch, but it does mean that those with mobility problems may not be able to visit. I entirely have Zohra and her Instagram obsession to thank for this gem! I’m beginning to think that every single shopping centre in Paris is photoshoot ready… It was built in 1823 and is now considered a historical monument – I’m not surprised at all! It’s also not far from Le Palais Royal, so you can walk from one to the other in no time. Possibly one of the best hidden gems in Paris? Montmartre is best known for the Sacré-Cœur, but that’s not all you will find in this Parisian neighbourhood! The white basilica dominates the skyline here, but you should also make sure not to miss the rest of what this area has to offer – many of the most beautiful places to see in Paris are in Montmartre. The Moulin Rouge is here, as well as the Church of Saint-Pierre de Montmartre, which is one of the oldest surviving churches in Paris (but often missed due to the aforementioned Sacré-Cœur) and is said to date back to the 3rd century. For those interested in art, music and museums then the Montmartre Museum may be of interest, where the composer Eric Satie once lived, and the Bateau Lavoir, where Picasso and Matisse once resided. However, the main attraction is – without doubt – the impressive basilica that stands on the hill above Montmartre. “La Basilique du Sacré Cœur de Montmartre”, or as most people refer to it “the Sacre-Coeur” is actually relatively ‘new’ as well-known churches go, since it was constructed from 1875 to 1914, and only formally dedicated in 1919, after the end of World War I.
Emily from The Glittering Unknown recommends visiting early to catch the sunrise and get great shots without all the tourists! I also highly recommend reading her post to find more Instagram spots in the Montmartre area. 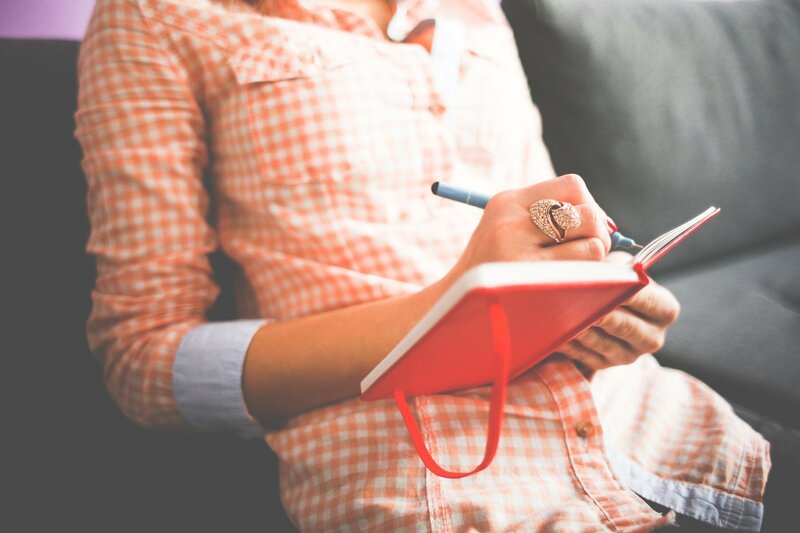 Looking to improve your Français before jetting off to Paris? The Lonely Planet French phrasebook is perfect for brushing up on those basics, merci beaucoup! This is such a great spot to simply sit and relax! People watching, picnicking or simply getting some sun are a great way to while away a few hours in the Jardin du Luxembourg. The garden and the palace it was built around (conveniently named Palais du Luxembourg) were created and constructed in the 1600s by Marie de’ Medici and built as an imitation of the Pitti Palace in Florence. The gardens cover a total of 23 hectares (around 57 acres or 230,000 square metres). Basically, they are MASSIVE. Okay so I’ve already mentioned that Paris seems to have a thing with pretty and Instagrammable shopping centres… but here’s another. I KNOW. Sorry, not sorry. The shopping centre (mall? Epic building? Magnificent work of architecture?) is an incredible place – let’s just say remember to look up. The ceiling is seriously fantastic! It is also another perfect place to visit the terrace for great views of Paris (although sadly there is no roof café here). Tour Montparnasse in itself isn’t attractive at all. It’s a bit of an eyesore on the skyline of Paris and in 2008 was voted the second ugliest building in the world. According to our tour guide (and the Wikipedia page), the view from the top of the Tour Montparnasse is the most beautiful in Paris… since it’s the only place where you can’t see the tower itself. Ouch. There is a fee to visit the panorama observatory, which was why we didn’t go in the end. However, the views are absolutely incredible! For the best viewpoints of the Eiffel Tower, check out Zohra’s top four round-up! I was so disappointed that we ran out of time before we managed to visit Musée d’Orsay. It’s at the top of my list of must-sees for when I next visit Paris! The building that houses the museum actually used to be a railway station, which you can see in the architectural style. It is now one of the largest art museums in Europe and is an incredible work of art in itself. Don’t forget to buy your ticket! There is also free entry on the first Sunday of each month, as well as at any time for under 18s and also those aged 18-25 who are residents or citizens in an EU country. 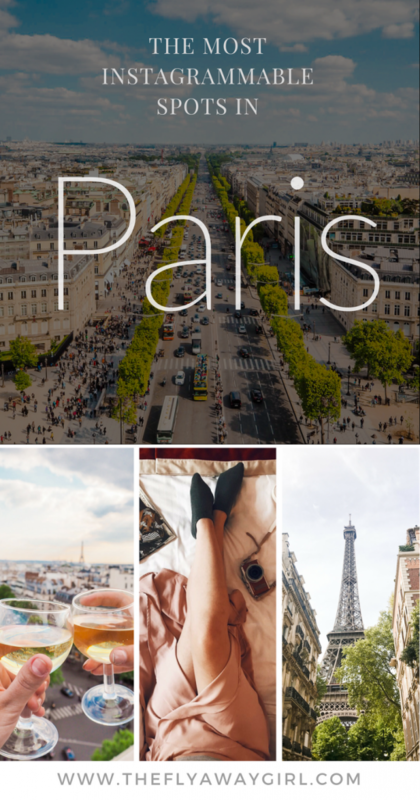 If you are like me and love having a physical guidebook to carry around, then I highly recommend the Lonely Planet Paris guidebook – it’s compact, detailed and has all the best places! Public transport in Paris is perfect for travelling around to reach the above ten spots! We travelled most of the time by metro and train (RER) and I would recommend purchasing a carnet (“car-nay”), which is a pack of 10 tickets and costs €14.50 (as of August 2017). These can be purchased at any metro station. 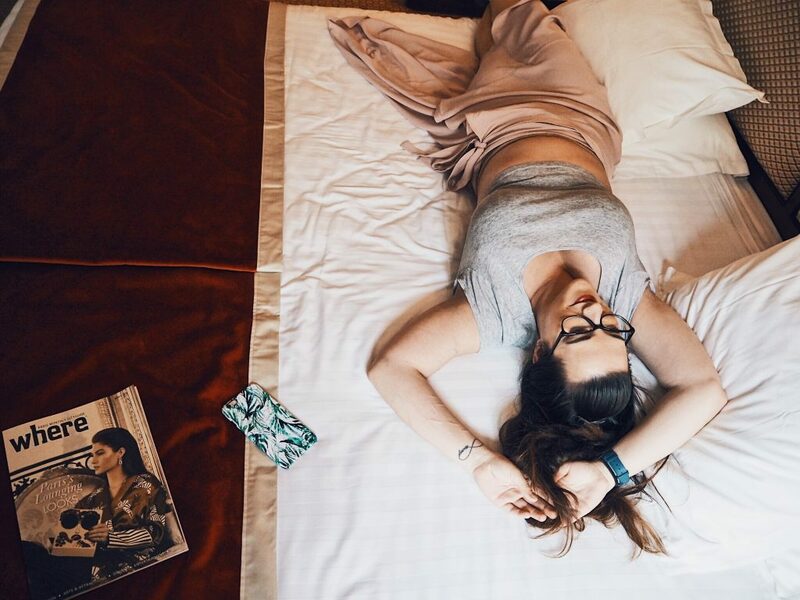 These hotels are Instagrammable in their own right! I highly recommend Hotel Adèle & Jules for a more homely feel in the city (I mean, they have a happy hour in the afternoon with free tea, coffee and croissants – FREE CROISSANTS) and Hotel Rochester Champs Elysées for full on luxury! I also met a businessman at Hotel Adèle & Jules who was from the same small town in England as I am… That was definitely one of those ‘odd coincidence’ moments! Note: I was sponsored for a two-night stay at Hotel Adèle & Jules and Zohra and I were sponsored for a two-night stay at Hotel Rochester Champs Elysées in exchange for social media coverage and our honest reviews of the accommodation. As always, all opinions are my (and our) own and I would never recommend somewhere I didn’t love myself! 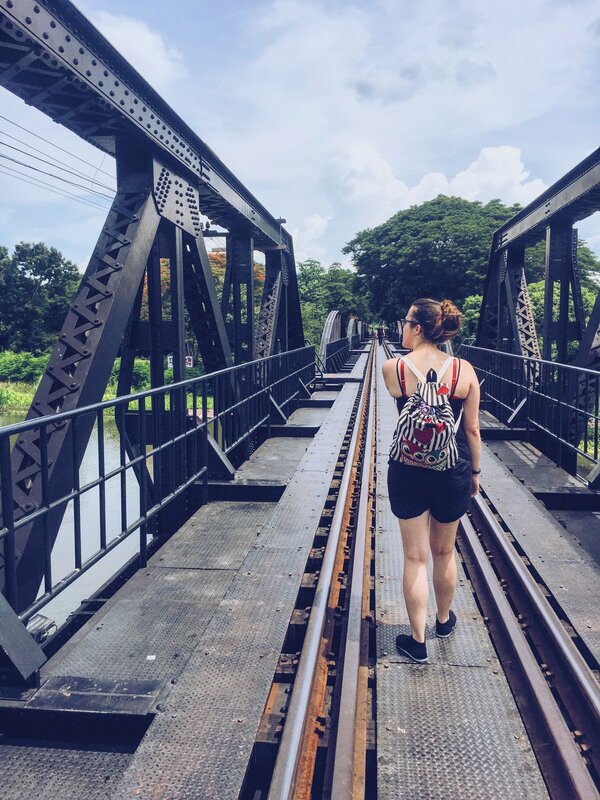 Well, this is a post about the most beautiful and photogenic spots so I might as well include some tips here too! If you are shooting for Instagram, then the optimum would be portrait and a 4:3 ratio. This fills the screen well on most phones so people can see the best of your photo! If you are shooting for a blog or for other photography purposes, then generally landscape would be better for city views and so on. How do I get a photo without people in it? Well, sometimes it can be people that make the shot! A well-timed cyclist or an elegant French woman walking away from the camera can totally make a photo, but sometimes you want your photo void of all people (or only with your subject in). The best way to get photos without people in them are to go to the place when no people are around. It sounds simple and it is… but usually involves getting somewhere for around 5-7am, depending on the time of year. The other (cheekier) option is to simply edit people out, but this is a lengthy process and you need a lot of practice if you want it to be perfect! How can I edit my photos like yours? Why, thank you for asking. I always do before and after shots on my Instagram story so people can see how I edit my photos and this eventually led to creating my own presets! Paris was one of the first locations I did this for and, if you use Lightroom, you can get my presets and edit your photos in a similar style too. 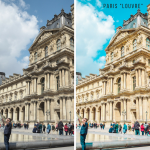 These presets aren’t just exclusive for Paris photos either – I have been informed by James of Lost Traveller that they work very nicely on his Japan photos as well! My Paris presets are now available for purchase and as a thank you for reading (and hopefully enjoying) this post, you can get 20% off the Paris pack with the code ‘INSTAPARIS‘ – just enter the code at checkout! Of course, there are so many more beautiful places in Paris and this list could go on forever. However, I have selected my top choices to highlight here and I hope you enjoy discovering your own as well! Have you been to Paris? What are your most Instagrammable spots in the city? Did you enjoy this post? Don’t forget to pin it! Paris itself is beautiful! to find insta places in Paris is not blasphemy? 😛 just kidding. Beautiful pictures. And you look marvelous. Such an infectious happy face. This is what travel does to one! 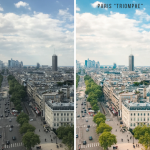 This is a great guide for photographing Paris. You took some amazing shots! Well, I’m definitely missing Paris right about now! You managed to get some incredible photos. We loved the view from Tour Montparnasse last time, but definitely need to check out the rest of these spots next time we are in Paris. Sacre Coeur is at the top of my list! These spots are great, both instaworthy and places you’d want to check out anyway! And sign me up for the wine and views! I have never been to Paris so I can;t tell about how touristy the locations are, but your photos are so beautiful! You have definitely found Instagramable spots and angles in the city of love that make it look so romantic. So many amazing and beautiful places. Makes me want to get my camera and go back to Paris! !